There are so many reasons why I love Girls Weekends. It gives me a chance to decompress, relax a bit and most importantly, spend lots of quality time with good friends - no distractions, no kids, no work. I also love Girls Weekend because it means I have the opportunity to try out new workout classes in a new city. This past weekend, My Fave Fitness Hero, a good friend and I headed to West Hollywood for a weekend of fun. Fortunately, we all have Class Pass so on Saturday morning, we checked out what classes were available. One of the classes that caught our eye was a class entirely based on the VersaClimber at a place called Rise Nation. It was described as a full body, zero impact, 30 minutes workout. We couldn't resist so we signed up and headed over to the studio. Rise Nation is an open two story studio with a check in desk and retail located on the first floor. The staff was super friendly and excited to have a few out of towners join the class. After we checked in, we climbed up the stairs to the second floor which houses a small seating area/lobby with two restrooms. This area then leads into the large studio with about 30 VersaClimbers and a stage. I was new to the VersaClimber so I wasn't sure what to expect. Fortunately, there were three staff members along with the instructor to help individuals get settled in and walk them through the user of the machine. The team member who helped me got me strapped into the machine and then walked me through how to use the machine. The machine has a computer on it with different stats. However, the team member did not walk me through the computer and it turns out, we would not use it in class at all. Hands down, the best part of the studio was when class starts. There are motorized black out curtains that come down and the entire studio goes pitch black. Until the ceiling lights turn on. It's one of the coolest things I have ever seen. The ceiling has a cool hexagon like pattern to it and there are lights that flash on and off in different colors. It is AMAZING! Then the music kicks in and class officially starts. The first thing I noticed about the instructor set up was that it was difficult for her and for us as rookies. The VersaClimber is set up on stage so that it is facing the mirror and the instructor's back is to the class. This means the instructor can only really connect with the class by looking into the mirror and the class had a limited view in terms of observing form. The class itself was full of blood pumping music and lots of energy. Although it was only 30 minutes, it felt a bit longer to me because I could not get comfortable on the machine itself. If you do visit the studio and are new to the machines, I would recommend asking specific questions up front about form. For example, it was unclear to me how much should be legs versus core in getting my body to move. And when focusing only on the lower body, it was unclear to me if it should be more of a squat position or something else. I would recommend the workout for anyone who likes to try different types of classes and is looking for a good sweat. I'd highly recommend getting some pro tips up front. I think that would have helped me have a better workout and probably would have allowed me to stop worrying so much about whether I was going to hurt myself! Round 2 with ULA and Us was last Saturday at Oola Distillary in Capital HIll. What better way to kickoff the weekend then some quality time with Ula and Oola!? I had never been to the Oola Distillary before so was impressed by the space. It was GORGEOUS. When you first walk in, you walk into a smaller space that serves as the tasting room. The space is set up beautifully with a bunch of shelves that display all of their liquors. From Vodka to Scotch to Whisky, they offer a great variety. When you walk through a large door to the left of the front room, you walk into a huge open space that houses all the barrels. It was the perfect ambiance for a fun Boot Camp class with Christy and Ives. Christy and Ives had set up to the far back of the room and had us lay out our mats in 4 rows facing them. There were about 15 people there and it was the perfect number. We fit into the space nicely - not so tight that we felt like we couldn't move around during the cardio portions but enough to feed off one each other's energy. Christy and Ives kicked off the event, as they always do, with a quick intro of themselves and their mission for ULA and Us. Proceeds from his event would go to Global Giving to help the various hurricane victims across the country. We started off with a 5 minute warm up and then went right into it - a 7 minute (YES 7!!) ab series. They had us run through 7 different exercises for one minute each. It was actually a great way to get started and warm up our bodies. We then moved to a partner series for legs. This was the hardest series for me mostly because one minute feels like an eternity when you are used to 20 second tabata sets!! In this partner series, one partner took a band over her/his knees and in a low squat, took the same leg out to the side, back to the center, out behind them, back to the center and went through this series for a full minute. Meanwhile, the partner would do Around the World jump squats. In the next series, the partner with the band would switch legs and go through the same exercise while the other partner would hold a low squat and pulse. Then the partners switched and went through the same two exercises. The next series was one of my favorites. We alternated between push ups and the Sphinx (as Darsenio calls it). This move has you start in a plank and then move to a forearm plank and then back to a full plank. Ideal both arms move at the same time. A modification is to move one hand. It's TOUGH and one of my favorite core moves. We wrapped up with a few tabata series that kept the energy up and fun. There was a 4 round series with just burpees, which you know I LOVED. But I was glad we only did 4 rounds. I don't think I could have gone 8 full rounds!! We finished up with a fun plank series with the option to hold the plank during the 10 second break. You know I loved that!! 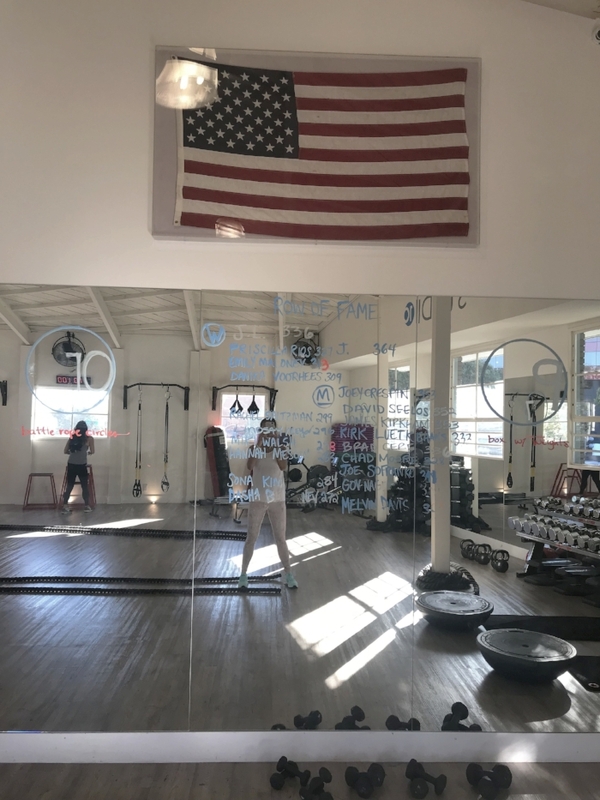 Similar to the last Boot Camp, the music was awesome, always the right beat for the exercise and they did a great job with the sound system considering it was a space that is not normally used for a workout class. I'm always impressed at how Christy and IVes are able to keep the energy up and the people motivated in a new space. They don't miss a beat and always have an unbelievable amount of energy. One of them is always going through the exercise so you can see the correct form and the other one is always running through the crowd pumping everyone up. This was the first time I was able to stay after the workout and mingle a little bit. What was truly evident was the incredible community they have created. They truly believe in creating an opportunity to connect and it was obvious in the way the group mingled and the way they both interacted with each and every one of us. They went out of their way to get to know everyone (or find out more about people they already know) and find a connection. In a time when so many of us are lost in our own worlds and glued to our devices/phones, I am grateful for these two ladies. They have created an incredible forum to allow us to connect with other human beings and remind us what life is really about. I've been following @ula.and.us on Instagram for about a month now. My friend, Angela, happened to be at Gas Works Park one night when she saw a group of people working out and then settling down with a few drinks. She texted me right away and said, "WE HAVE TO FIND OUT WHAT THIS IS ALL ABOUT!!!" She found out that these two ladies, Christy and Ives, pull together monthly get togethers focused on working out, giving back and of course, DRINKING!! I was SUPER excited when they posted their August event and it happened to work with my schedule. Unfortunately Angela was working so she couldn't make it but our friend, Lindsay, was available and ready! The August event was hosted at Peddler Brewery in Ballard with 25% of the proceeds going to Fist Aid Arts, an organization that works with trauma care providers to equip them with art tools and supplies for patients. Such a great cause. Lindsay and I were one of the first ones to arrive. Peddler has a huge outdoor area in the back that is a mix of cement and sand flooring with about 8 picnic tables laid out. Christy and Ives did a great job of utilizing the space and setting up 5 different stations. You could tell they were definitely pros when it came to utilizing outdoor space with minimal to no gym equipment. We were immediately greeted and waved down by three guys sitting at a picnic table. They had us sign in and then helped us get settled in. Christy and Ives came over as soon as they saw us and quickly introduced themselves. Both of them have this incredible energy and excitement. The second you meet them, you will think you can conquer anything.... literally. Over the next 10 minutes, the space quickly filled up with about 25-30 people. And then we were off. Christy and Ives started the event with brief intros including their background and why they started these gatherings. Both are from the Midwest and have a love for community, fitness and drinking! They've pulled these events together in hopes of building a strong community while giving back to the community. This intention was evident throughout the entire event. The final round was a bit of a fun twist. We partnered up to do burpees and plank jacks. What's even better, they handed out prizes which of course brought out the competitive side of ALL of us. It was intense, hard and Crazy but SO FUN!! At the end, most everyone stayed to hang out and grab a few beers. Unfortunately, Mom duty called so I had to head out but I wanted so badly to stay and hang out. These girls have created such a great community of people who love to workout and just want to have fun! I consider myself a fan and will be hoping to make their next event on 9/23. Follow them on Instagram for details. If anything, Christy and Ives will teach you that you can literally workout anywhere with minimal equipment. I'll definitely be stealing some of these exercises for my next vacation!! Thank you, Ladies, for inspiring all of us and building such a strong community... all while giving back!!! This week, I'm on vacation with the family and a group of good friends at Lake Chelan. We've been looking forward to this vacation all summer but it also means I won't have my usual gym routine. I packed a few goodies to prep for the trip including a TRX, gliding discs and a bender ball. This morning was all about the gliding discs! I love gliding discs (or towels if you don't have a set of discs) because it can take any exercise and turn it into a solid core exercise. It forces you to engage your core and work on your form. Here are the exercises I did this morning. I did 8 rounds of each with a Tabata Timer (I use the Simply Tabata timer which you can download for free through the App store). Place the gliding discs under your feet and do a traditional sit up. The difference with this is your heels should dig into the ground as you come up. Tricia often uses the cue 'think of your feet dragging through the mud'. That's exactly how it should feel. Place the discs under your toes and rotate between a knee tuck and pike with a push up in between. I Love these because it works your abs, your quads and your upper body. I was slowing down by Round 4 and exhausted by Round 6. LOVE THEM!! These are a new move for me and a bit of a challenge. I incorporated this move from my recent visit to Studio 45. We normally do these off the back of the reformer and they are HARD for me. I tried these by lying on my right side, bending my knees at a 45 degree angle and placing one disc under my right hand. Push out as far as you can and then pull yourself back up. They are great for your obliques and your arms. Lie down on your back. Place the gliding discs under your hands. Come up to a sitting position by pulling your hands up until they are behind your back. These will work your triceps and abs! I also stole this move from my recent workout at Studio 45. I LOVE THESE!! Start in a full arm plank position and place the gliders under your feet. Move down to a forearm plank without moving your palms. Then crawl forward with your arms while dragging your feet. Then come back up to a full arm plank and repeat the exercise while moving backward and forward. SO good!! This is definitely a full body workout!! If you follow them on Instagram or follow the indoor cycling scene in Seattle, you've probably been eagerly awaiting the opening of City Cycle like I have. The only problem was they opened up their website the week I was in Mexico. And well, it's fair to say, thanks to the bottomless mojitos and sunshine, I didn't exactly make it onto the site that week. When I finally did, the only time that worked with my schedule was the Saturday of Mother's Day weekend. A bit of a wait but not a bad way to kickoff the big weekend if you ask me! And even better, Sara (of Fit Foods) was free then too! So we both reserved our bikes and counted down the days. City Cycle is located in a brand new building with a small parking garage (12-15 spaces). When you walk in, the check in area definitely has a new, modern feel to it. The two ladies working the desk were super friendly and ready to help us. Once you turn the corner past the check in desk, there is an open space with lockers, doors leading to the restrooms and a shoe wall. I LOVE the shoe wall. When you reserve a bike online, you can request shoes and enter your shoe size. Your shoes will be waiting for you and hanging under the number that correlates to your bike number. Genius and super easy! Sara and I changed into our shoes and headed into the studio. The studio is smaller than the ones I am used to but you don't even notice it when you get on your bike. There are about three rows, stadium seating style, and enough space between bikes where you don't feel as though you will sweat on your neighbor (or vice versa). Our instructor, Katie, greeted us when we walked into the studio and asked us to grab a set of dumbbells. You could choose from 2, 3, 4 and 5 lb weights. My gut was to grab the 5 lb weights but Katie recommended 3 lb weights given the arm series would be about 5 minutes long. I would find out later that she was right!! As always, Sara and I had bikes in the front row. Anyone who cycles with me knows I have weird quirks when it comes to indoor cycling. One of them is that I like to see my peddle strokes in the mirror so I like to sit in the front row. Luckily the bikes were the same Schwinn bikes we have at Community Fitness with one difference - NO MONITOR. Sara will tell you that not having a monitor, for me, is like not having rose at a summer barbecue. What's the point of going?!?! Luckily, Sara reminded me that this was a good opportunity to get through a class based on feel rather than numbers. Sometimes it's good to relinquish control and just go with it! When class started, I knew it was going to be FUN. The lighting in the studio is perfect for a fun cycling experience. It accommodates everything from a dark, focused ride to a motivating, pumped up ride. I LOVED it. If you workout with me, you know that music, energy, lighting, ALL of that helps push me. Katie got us kicked off right away and showed us the three different positions we would incorporate into the workout. I'm not going to lie, the first few minutes of the ride were hard for me. I could not focus. All I could think was 'what gear does this feel like? ', 'would this be a 4 or is this really a 2? ', 'how many RPMs am I REALLY peddling? It feels like 95-100 but what if it's 75-80?!??!'. Fortunately, Katie is a force to be reckoned with and she brought me back to the present with her energy. She is literally the perfect balance of a peppy cheerleader, your favorite late night dancing buddy and powerhouse motivational speaker. She went from pushing us up hills to dancing around the studio to giving the best motivational speech to one of my favorite songs (Bon Iver's Skinny Love). Most of the songs were straight riding but there were two songs that were the dreaded choreography rides. If you know me, You know that I am not the most coordinated person. Coordination while biking and keeping up with the beat is just a recipe for disaster. My biggest fear is that I will fall off the bike. Katie had us doing a few basic push up type moves on the bike for the first song and then move into a few hip movements for the second song. I think it's safe to say I didn't do all the movements, I didn't keep up with the beat and I was more than thrilled when each song ended! After about 30 minutes Katie had us grab our weights and led us through a 5 minute arm series that included biceps, triceps and shoulders. It was a series that felt too easy at first but by the end felt good but not too challenging. I always struggle with weight series on a bike since it is difficult to switch out your weights. A bit of a bummer since I like to use different weights for my biceps vs. my triceps vs. my shoulders. (Tabata has spoiled me!) But aside from that small note, it was a good arm series and nice to get in something difference in the middle of the ride. After that, we went through 3 more songs to wrap up the class. I will say, by the time class ended, I felt as though I had been there for 15 minutes. It literally flew by. Riding without a monitor was also a good reminder for me to consider different types of rides and not be so numbers driven. I found I didn't push myself as hard during the class at City Cycle because I didn't have the numbers to motivate me. But since then, I have actually made a conscious decision to cover up my monitor for at least two to three songs per class at Community Fitness so that I can learn how to push myself based on feel. So if you're heading to City Cycle and are used to the monitors like me, I'd recommend preparing yourself mentally or doing a few rides with the monitor covered up. All in all, Sara and I had a blast. Katie was AMAZING and I look forward to going back to City Cycle when it works with my schdule. You know I was obsessed, OBSESSED with Core Power Yoga after visiting the Ballard studio a few weeks ago. So when my good friend, Kolena recommend we go to Yoga on Monday night, the Fitness Hero recommended we go to the Capital Hill studio. Why not? Can't go wrong! Kolena and I headed to the 7:30 PM C2 Core Power Yoga class. This class is described as one that "strengthens, balances and detoxifies your entire body and mind as you move through more challenging postures and connected breath." It sounded TOUGH. Not only that, the room is set to 95-98 degrees with added humidity. Yes, they ADD HUMIDITY! I knew I was in for a true challenge. The studio itself is at a great location in Capitol Hill - on the corner of Broadway and Republican. When you walk in, the studio has a lofty feel as it covers two floors. The retail area is smaller than the Ballard studio but still had a lot of great stuff and a bunch of great sale items. The woman that checked me in, was also the instructor. She was very friendly and helpful. The one feature I did not like about the Capitol Hill location is the locker rooms with restrooms and showers are upstairs while the studio is downstairs. So I headed upstairs to lock my stuff away and use the restroom. Then wore my flip flops downstairs and stored them in a cubby on the first floor. Just a minor inconvenience but a small note about the layout. The studio itself is nice and spacious. As soon as I walked in, I was hot. I hadn't even done anything yet and I was hot. NOT a good sign! Kolena and I set up in the back of the room. The class filled up very quickly and by the time we were ready to start, the room was filled up with just enough room in between all of our mats. The instructor (Juliana) started off by giving us a moment to close our eyes, clear our heads and connect with our bodies. It was a good reminder as we got into class that we were here for various reasons and needed to set our intentions and focus on them. From there, we moved into sets of traditional yoga poses. All of them were standing yoga poses that ultimately ended with your Chaturanga. What I loved about Juliana was her energy and her constant encouragement. She also provided several options throughout the flow to push yourself, test yourself and often, help you feel more comfortable. She never actually sat in the front of the room (she didn't even have a mat set up) so this allowed her to walk around the room and help as needed. I would note that if this is the first yoga class you take or are not as familiar with yoga poses, be prepared to rely on a neighbor to show you what each of the poses are. I had to rely on people around me as several of the poses faced different directions of the room. The one thing I will note about this class is that the added humidity made it HOT. Uncomfortably hot. And you are talking to someone who runs cold. About 40 minutes into the class I was sweating so much I had to stop every 2-3 minutes to wipe sweat off my face and body. It was that bad. I rarely drip in sweat and I think this was the first time I remember being so uncomfortable that I could not get through my poses. Outside of this, the class was great. It ended with your typical Savanna which was definitely much needed for me! All in all it was a good class to stretch out my body but not sure if I will go back simply because of the humidity factor. Both Juliana and the studio itself were great!